"I see, the gentlemanly type. Very nice." The woman in the black robes delicately clasps hands with Pepe, her long, red-painted nails brushing his wrist. "Careful, or you might have to put a ring on that..."
Suddenly, there are two more hands reaching down just beside Pepe's. They're red, with strips of orange fiber attached to the backs. Pepe looks up and sees MacGruber and Lachdanan also leaning toward the lady. "We may help you up too miss!" says MacGruber. "Yes, we offer ourselves to lovely madam!" says Lachdanan. She shrugs, grabs one of their hands in each of hers, and briskly steps to her feet - nearly sandwiching Pepe in the middle of all three people in the process. Finally, everyone takes a step back, the scene around the lady finally taking on some semblance of propriety. As this is happening, Jeb stops alongside Rasputin and reaches up to clasp a hand on his shoulder. In an easy tone, he says, "We are bein' paid enough, that's the point. Y'all can play along with some goofballs if it's our most lucrative little trip to Harken ever. Trust me, none of 'em'll be any harm-" He glances back to Alice, who has quietly climbed into Tanya's usual semiconcealed spot on the wagon during the excitement, "-well, *cough* most of 'em anyway, y'know. Besides!" he says, now raising his voice so everyone can hear, "This here charmer is our own Tanya's cousin!" He takes a step toward the recent arrival, tips his hat to her, and says to your group, "Everyone, introduce yourselves to Miss Tequila Anime!" Those of you standing near Tanya can just barely hear her let out a groan. Phaedra, with large sheep tucked under each arm, gives Tequila a nod and sidles up to Rasputin, "She seems to be distressing the heal baby. I think she may have an anti-eyeware aura on..."
Rasputin, still frowning about all of this finally nods. "Better keep them apart or Tanya may end up electing to stay. Dont want to be caught on the roads without a real healer..." He glances back to Phaedra and then down at the sheep nestled in her arms sleeping away. "No offense." After a moment he adjusts his helmet back on his head before stepping forward. "Everyone planning to go get on the carts! We're going to be late otherwise! Think you can handle the horses for one of these carts Phaedra. They've been antsy around Peps lately"
"Speaking of running late, aren't we missing a passenger?" Pepe scans the area for the last goofball. "Ya got a point there, Tesla," says Jeb, "We do need'ta be gettin' this here show on the road. But we are missing someone... Tequila, where's that, ah, gentleman friend of yours? You didn't part ways with the poor feller already, did you?" Tequila grins. "No, no, I just met him a few days ago... why would I leave a man behind so soon, hm?" She looks to Rapsutin and Pepe, adding "...well, I could think of a couple reasons...", and makes a sly wink. "But no, my baby is on his way. He just had to, you know, stop for a moment. Should be coming just now." There is, in fact, another figure approaching on the path - a tall, muscular one. As he comes closer, you see from his slightly brown skin and sharp, protruding lower teeth that he's a half-orc. There are two travel sacks slung over his broad shoulders. He's dressed in some items of fashion common only in lands far to the south - pants made from a rough, blueish material called "den-ihm", and open-toed leather sandals. The half-orc has an unhurried gait, and wears an easy grin on his face as he approaches the gathering. "'Eyyy, Taqi babe, I made it. Did you wait long?" Tequila sidles up to him, and wraps an arm around his waist. "No, my Pepito, not too long. After all, I had these nice boys here to keep me company." Pepito scans the group. Rasputin has already proceeded to the frontmost cart, but Pepe and the twin Dorfs have still lingered by Tequila. The half-orc frowns, grits his teeth for a moment, but his expression suddenly pops back to an easygoing smile. "Ohh, I get it. That's real cool man, thanks for lookin' after her, guys." The twins nod enthusiastically. "Yes, anytime sir." "Yes, we look after madam most anytime." "We see you bring bags for her. May we take her bags?" Pepito rubs his chin while considering this for a moment, then says, "Nah, don't worry about it you guys, you just chill. You there little man!" He looks to Pepe, "You work here, right man? Could you be totally cool and show me where to put these bags? You would be like, the based nugget man if you helped me out with that, man." He hands one of the bulky travel sacks down to Pepe, who notices right away that the half-orc carries a powerful, somewhat sickly-sweet odor to him - which also seems to linger on the bags. "Oooh," Tequila says, "Are we getting on the carts now?" She scans the three carts that are now lined up, enhorsenated, and ready to go. After Tequila's arrival on the scene and Rasputin and Pepe's timely distraction, Tanya quietly scooted herself behind the third cart, and is now practically ducking to conceal herself. Tequila, however, catches a glimpse of spectacles poking up from beyond the cart and is over there in an instant. "Tanya babee, I never did get to greet you! It's been so long, come here~~"
After doling out embraces, exclamations, and at least one kiss on the cheek that leaves a bright red mark on Tanya's face, Tequila drags her cousin up into the third cart. "Come on Pepito, come meet my little cousin here!" "Alright Taqi, she seems real cool, I'm comin'! Hey little Pepe-man, ya gotta come join us, you seem super chill too man." The twins, seeing that their first choice in company is now in an overly crowded cart, settle for riding with the fellow musician who showed them much hospitality. With that, all preparations for departure are now complete. Jeb takes the reigns of the lead horses, and with a booming "Giddy up! ", the Crandel Caravan is now off on their latest journey. "So," Ruth leans closer to the twins, eyes wary. "If you don't mind me asking, why are a couple of dwarves interested in the southeast? Visiting family?" She examines their beards as close as they let them, determined to find the true identity of these obvious posers. Pepe considers his new companions and decides to engage the least odious of the two. "So, Miss Tequila, was it?" he says, glancing back towards her. "Jeb said that you were an old friend of Tanya's. Did you grow up in Fallcrest?" Close exami- well, not even that close of examination really, you just- they are thoroughly Azkelak and Katal. One of their tails appears to have come unraveled from beneath their kyltte, and it's making you a little uncomfortable. "Ah, hello demon lady!" says MacGruber (aka Azkelak). "Hello, yes, your demon kind is very frightening to our Dorf people," says Lachdanan (aka Katal). "Anyhow, is no matter. Yes, we are heading down to Harken." "Indeed, we hear of great business opportunity there." "We maybe tell you two about it..." says MacGruber, leaning a bit closer, "if you promise you not tell nobody." "Oh, Fallcrest? No, no, sweetie, I only stop in once in a while. Not enough hustle and bustle for Tequila's tastes, you know. I haven't been by this part of the world in, oh, years now, not since me and Tanya were little girls. You remember my last visit, don't you Tanya?" Tanya's cheeks begin to go red - though part of that might be the lipstick she hasn't completely succeeded in wiping off. "Y-yes, I remember it. So, there's no need to go into any details. At all." Tequila throws her head back and laughs. "Oh, Tanya, I thought you'd be a little less shy by now. Though I guess if you're running around the Vale with friends like this, maybe you have changed - a little." "Woahh, Taqi, you didn't say you'd been around this place before!" says Pepito. "Well hey, maybe you know about this plant I just saw, it's some kinda weird species they don't have back home..." He reaches over the side of the moving wagon and plucks the leaves of a tall plant that's growing toward the road, then hands them to Tequila. As they examine them, Tanya leans close to Pepe and says quickly in a low voice, "Look, I want to explain about her. We call her my 'cousin' for convenience. I've studied my family tree for years, and the biggest mystery on it short of the King himself is Tequila. Nobody's ever determined exactly how she fits in to the family; the only thing I've figured out for sure is that her birth was downright impossible without time travel being involved." "Aw man!" says Pepito, stuffing the leaves unceremoniously into his bag, "so that's not the stuff we were looking for, huh? Ah well, I'm still sure we'll find plenty where we're heading. Hey little bro man, you know anything about the plants around here? I'm actually a trained herbalist." Now it hits you, Pepe - this is the same guy you beat at cards a few nights ago at the Nentir Inn. You probably didn't recognize him since that taproom is extremely shady in the literal as well as the figurative sense. Not to mention your winnings weren't very memorable - he's the one who offered up nothing but a small pouch of vaguely-identified dried herbs. On the flip side, it doesn't seem he's recognized you at all. "So, uh, miss Alice," says Jeb, attempting to strike up a conversation with the still-hooded woman in the first cart, "you know these parts well?" "Nope," she says, "just passing through." "I see. Well then, do you come from-"
"Mr. Crandel. I don't know if I made myself entirely clear earlier, but, I'd appreciate no personal questions." Jeb sighs. "Yeah, I reckoned as much. Well, that ain't nothin' we ain't dealt with before. Still feels odd for us to be the only silent ones in this here wagon train - d'you mind if we tell you a bit about us?" She considers for a moment. "I suppose that would be fine... so long as your stories don't require any shouting." Jeb laughs. "Naw, not much. Tesla, you're one for spinnin' yarns, why don't you tell her a bit about all the different kinds'a heck you've led the group through?" He gives Rasputin a quick wink. Pushing aside Tanya's worrying explanation for the time being, Pepe turns to Pepito. "Trained herbalist, eh? I'm not much of a fan of fruit picking and weed pulling and what have you, so I can't tell you much about the plants around here." Pepe takes a moment to try to remember what the hell kind of farms Harken even has. "I... I have it on good authority that Harken is famous for its bountiful mumbletrees and fresh-off-the-vine *coughing, looking away*"
Phaedra is more than happy to make 'promises' to the two Dorfs, "We'd never tell anyone, we don't even like to talk, right Red Baby?" "Err, well, I mean you love to shout a lot... and I'm always telling stories of our exploits, but other than that we'd never tell a single soul... So you can totally trust us." "Saved Fallcrest once. 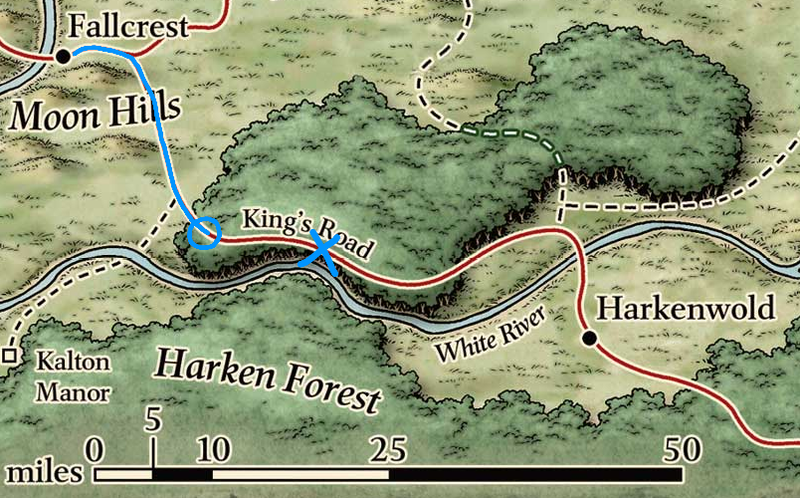 Place got hit by a raiding party of Hobgoblins all centered around a fire tossing ogre." Rasputin lights up a pipe and handles the horses as they round the southern pass. "Peps distracted the big guy long enough for me to get close. Knocked him down in one charge." Rasputin looks on at Pepe's thousand yard stare on his cart and then shakes his head. He then makes a note to make sure Pepe doesnt purposely crash his cart due to the passengers constant gibbering. "I have a habit of taking uppity people down a peg so to speak." "Yeah man, I'm all about them 'bountiful trees', for sure." Pepito throws his head back and lets out a hearty laugh. "Nah, little man, it's cool if you don't know nothin' about plant. That's kinda why I'm around, y'know, I love to educate dudes about stuff. I know all about the good stuff, man. See, lemme show you.." He reaches into a pocket and produces a bundle of herbs identical to the one Pepe received before. "You take some of this stuff, and you-" "No, no he doesn't." Tanya's suddenly sitting fully upright, a rare but not unprecedented stern look on her face. "I also know about that stuff, and as the de facto medical advisor for this caravan, I will not allow you to distribute any." Tequila rolls her eyes, and mutters, "Oh dear, here we go..." Pepito stiffens, a stunned look on his face, as Tanya continues, "There's shaping up to be enough distractions on this trip as it is, without that... stuff going around to muck people's brains up." The bundle remains sitting in Pepito's outstretched hand, his expression now becoming a frown. "Hey man, why you gotta be talking like the man, man?" "Because you show up here and try to-" "ENOUGH, both of you!" booms Tequla's voice, startlingly forceful. "Pepito, honey, I told you this wouldn't be the right place for that. We're Tanya's guests right now, you gotta listen to her ok?" Pepito lets out a low growl. "And Tanya, please forgive my sweetie Pepito. He does... 'business' in other corners of the world, this is like instinct for him. Let's let the plants be and just get along for the next couple days, ok?" Tanya crosses her arms. "Well... if we don't hear any more about the plants, yeah." Tequila smiles gently. "Good. I want my sweetie boy and my sweetie cousin to be friends. And I haven't forgotten you there either, Mr. Moustache~" She turns her gaze to Pepe, and gives him a wink. "And I have something much more pleasant to discuss now. I see that you and Tanya sit quite closely there. My practiced eye did not miss her whispering to you earlier, either - and now she looks out for you so closely as, ah, 'medical advisor'. So, since Tequila sees so much already, I think you can tell Tequila how it really is with you two - hmmmm?" Tanya blushes incredibly deeply, and begins to stammer "I-I-I-that-no-" Tequila makes a "shhh" noise and puts a finger to her crimson lips. "I want to hear what the gentleman has to say~"
Lachdanan nods happily. "Yes, Miss tall-drum, we know you to be one we can trust." MacGruber does the same. "Yes, and you too demon-lady, your kind scares Dorf but maybe we think you are not too bad." "So look, we hear of great opportunity near town of Harken." "Yes, see, we want to start our own business." "We hear story in many bar-room that there was a Goblin lair near Harken." The left side of Lachdanan's beard slides down his face slightly, and without looking, he casually corrects it. "Yes, and some weeks ago, brave adventurers killed all the Goblins!" "Yes, they were heroes of the Harkenwold." "But now Goblin lair sits empty." "So, we think, maybe we go in there. See if there is not treasure adventurers missed." Macgruber wrings his hands excitedly, significantly loosening the attached strips of hair. "And then, since is such popular story throughout the Vale..."
Both brothers look at each other and put on wide grins. Together they say, "Tourist attraction!" "Yes, we put up signs, they say 'See where the Bramble Company killed all Goblins! Only 5 gold!" "Was maybe not all Goblins, but will be good for bringing people in." Lachdanan strokes his vibrant beard thoughtfully. "We think that was their name, Bramble. Is what we heard in the stories." "So! What do you think of plan?" Alice listens calmly to Rasputin's story, raising an eyebrow when he gets to the part about knocking down an ogre. "My my, that's quite a-"
"ENOUGH, both of you!" comes the shout from the last cart. Alice gives a dark frown. "I suppose the idea of a silent journey's out the window." Jeb turns his head slightly, still keeping one eye on the road. "Yeah, sorry 'bout that Miss. If I'd known you wanted perfect peace and quiet, I'd'a told you to wait for one of our smaller-scale trips. Seemed like you also needed to get where you were goin' quick, though." Alice loosens a little, sitting back in her seat. "I understand, Mr. Crandel. I suppose I've just been very anxious this whole time. It probably would be best for me to relax a bit at this point, being in Mr. Tesla's capable care." She gives what looks like the first earnest smile you've seen out of her. "Especially since I seem to have him half-convinced I'm going to stab and burgle the entire party in the middle of the night. Really, I'm not that kind of cloaked vagrant. Now please, continue your story- I really was enjoying it." As mentioned, the trip to Harken is a two-day journey. You've nearly reached your stopping point for today (indicated with the X). It's the place where the White River comes closest to the King's Road. It's served as your resting point on previous journeys to and from Harken, with a fairly well-sheltered forest clearing not far from the road. It'll be time to stop and make camp very soon now! "This is a great idea. You can even capture some stray Goblins and have the children fight them in the ring of honor. I'd love to meet these Bramble folks and sing a song about their exploits..." Phaedra dreams up some business ideas with the Dorfs as the carts pull up into their resting spot. Hoping to spot a handful of bandits or ogres hiding in the bushes ready to fight, Phaedra looks over the clearing carefully. Wis Roll: 1d20 + 1 = 7. Rasputin keeps a eye on Tanya's cart before speeding the horses along to their upcoming destination. "Worlds full of people who would do harm to folks like us for nothing more than the food we're carrying. Still if you arent that sort then I feel for you. If your concerned you're being followed I'd say try and make you way through the mountains south of Dawnforge range. Mithralfast is tough going but theres a port town past it to get you out of Nerath and they generally dont ask questions." "Miss if I should be watching for something specific for whatever reason it'd be nice to know"